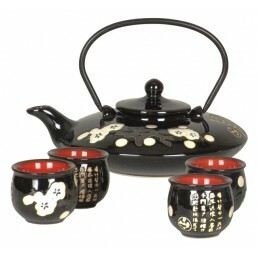 Description Black gloss teapot with flowers and Chinese characters. Includes a metal handle and.. 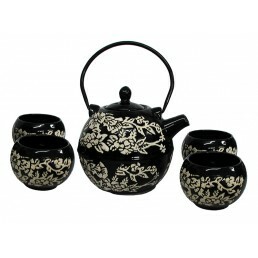 Description Black gloss Teapot decorated with a floral motif. Includes a metal handle and four .. 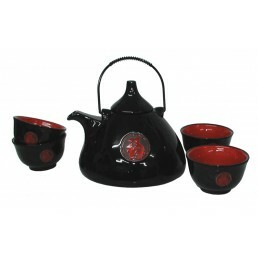 Description Black gloss Teapot with 'Double Happiness' motif. Includes a bamboo handle and two .. 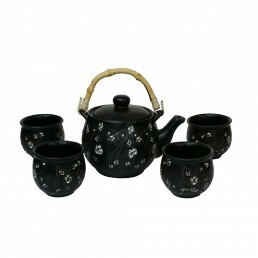 Description Glossy black teapot set with flowers and longevity motifs. Includes iron handle and.. 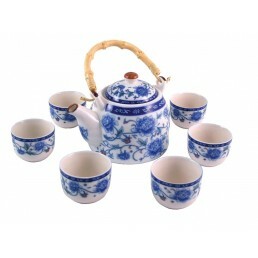 Description The Blue and White Glory Teaset features a flowering Morning Glory vine in blue and.. Description White porcelain traditional teapot decorated with two white dragons picked out agai.. 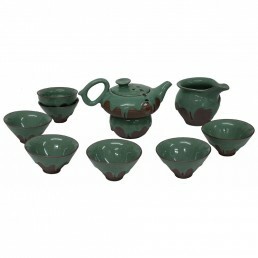 Description Dragon Egg Teaset for One includes single cup and pot in beautifully crackled celad.. Description Etched and textured pattern of white cherry blossom on black tea pot and four cup s.. 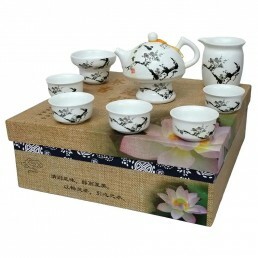 Description Etched plum blossom branches on black teapot and cup set. Includes bamboo handle an.. 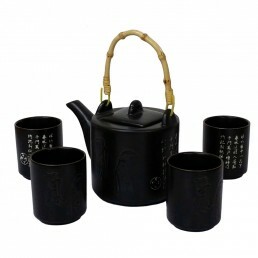 Description Feng Yue Poetry Teaset with character and poetry etched on to tall black teapot and.. 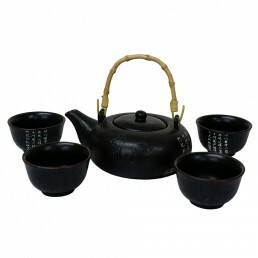 Description Black glazed round porcelain Feng Yue Poetry Tea Set. Includes flexible bamboo hand.. 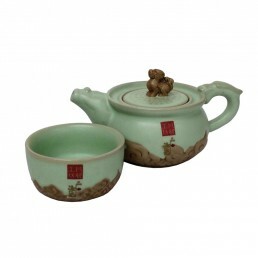 Description Good Fortune Teaset for One in Ru-ware style porcelain, includes single cup and pot.. 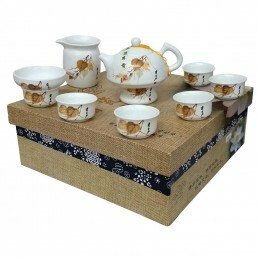 Description Fu Dog Teaset for One includes single cup and pot of in Ru-ware style porcelain top.. 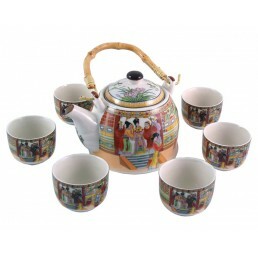 Description White porcelain traditional teapot decorated with a colourful scene of ladies at pl.. 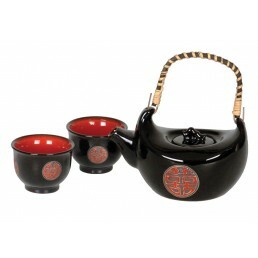 Description Glossy black 'Good Fortune' teapot with four cups in presentation box. Including me.. Description The Green Iced Teaset is stunningly glazed with a green dripped 'icing' over a brow.. 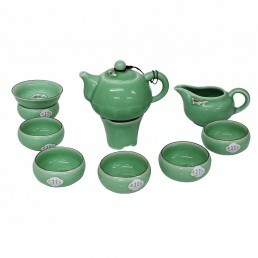 Description The Poplar Leaf Teaset features a teapot in delicate green and a shape reminiscent .. 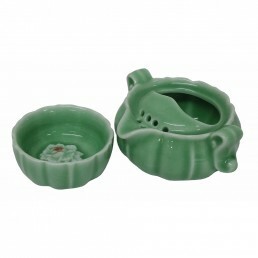 Description The Koi Fish Teaset is a stylish set in green porcelain with a fish lurking in the .. 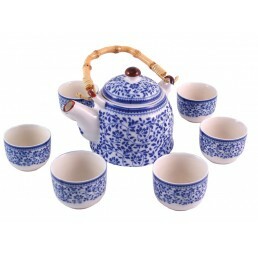 Description White porcelain traditional teapot decorated with a blue trailing leaves design. In.. 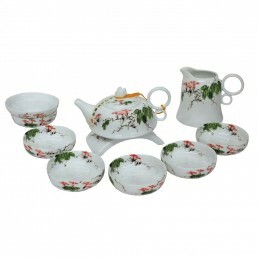 Description The Lotus Flower Teaset features Chinese Lotus buds and flowers on a white porcelai.. 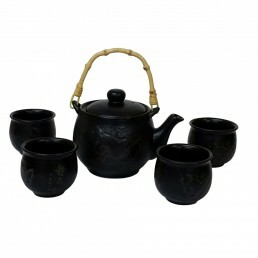 Description Black matt teapot with turquoise glaze and four cups. Dimensions (l x b x h) .. 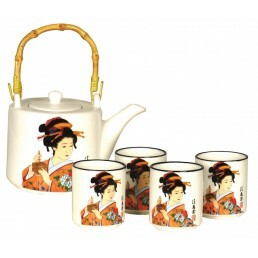 Description The Morning Glory Teaset features flowering Morning Glory vines on a white bone chi.. Description White porcelain traditional teapot decorated with a colourful scene of musician lad.. 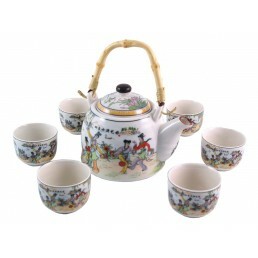 Description White porcelain traditional teapot decorated with nine flying dragons amid clouds a.. 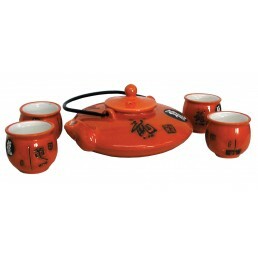 Description Orange glossy Teapot decorated with dragon characters. Includes a metal handle and .. 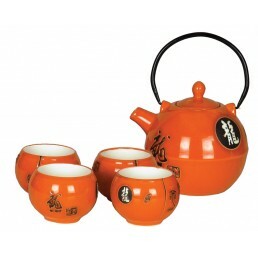 Description Orange gloss teapot decorated with Dragon characters. Includes a metal handle and f.. 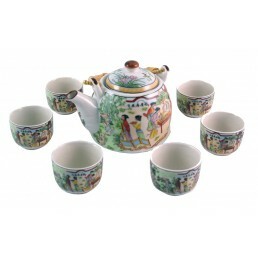 Description White porcelain traditional teapot decorated with a colourful scene of ladies in a .. 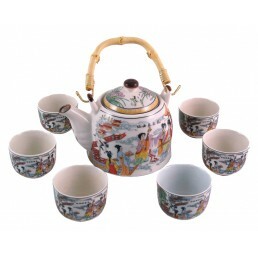 Description White porcelain traditional Chinese teapot decorated with a colourful scene of ladi.. Description White porcelain traditional teapot decorated with a colourful scene of pandas in a .. 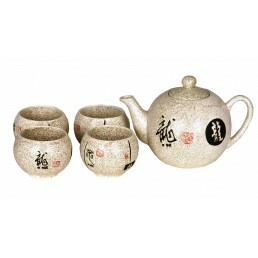 Description White porcelain traditional teapot decorated with peony flowers and leaves. Include.. 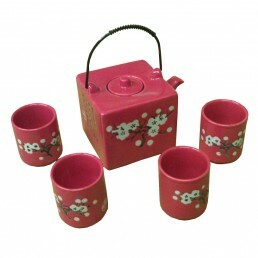 Description The Plum Blossom Teaset features flowering branches of plum blossom in sharp contra.. 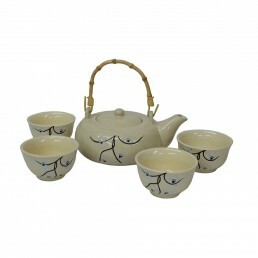 Description The Poplar Leaf Teaset features delicate stems of Chinese poplar in subtle autumn t.. 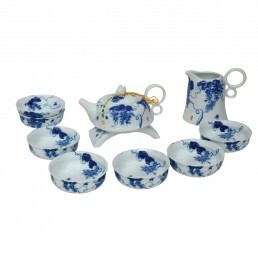 Description Pumpkin Teaset for One includes single cup and pot of porcelain with a flower to be.. 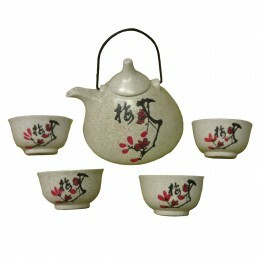 Description Square red Chinese teapot set decorated with blossom and calligraphy complete with .. Description Speckled white teapot decorated with blossoms and Chinese characters with four insu.. 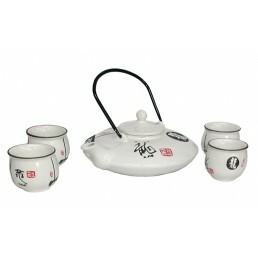 Description White gloss teapot decorated with dragon characters. Includes a metal handle and fo.. Description White Teapot decorated with Japanese ladies. Includes a flexible bamboo handle and .. 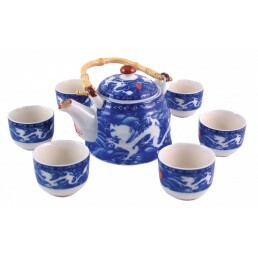 Description Speckled teapot with dragon characters with four matching teacups. Dimensions (..
Chinese tea is a beverage made from the leaves of tea plants, their scientific name being Camellia Sinensis, and boiled water. The tea leaves are processed using ancient traditional Chinese methods. Chinese tea is drunk throughout the day, including during meals, as a substitute for plain water. It is considered very healthy and a beverage for simple pleasure. 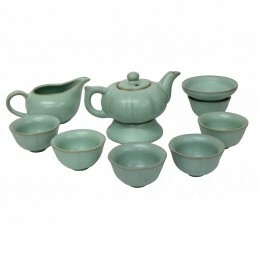 The practice of tea drinking has a very long history in China and this practice originated there. Although tea drinking classically originated in China during the Tang Dynasty, Chinese tea generally represents tea leaf processing using methods inherited from ancient China. This beverage is considered one of the seven necessities of Chinese culture, as well as firewood, rice, salt. oil, soy sauce and vinegar. Well over 2,000 years ago Chinese tea was starting to be used for medicinal purposes as well. Green tea is the most popular type of tea drunk nowadays. Chinese tea is generally classified into five distinct categories: white, green, oolong, black and post-fermented. Within these main categories there are as many as 1,000 varieties of individual teas. Some of the varieties are due to different strains of the Camillia plant. Some obtain their characteristics from local growing conditions. But the largest factor in the big variations comes from different methods used in tea processing after the leaves have been harvested. White and green teas are heat-treated quickly after picking to prevent fermentation (oxidisation). Oolong teas are partially oxidised and black teas are completely oxidised. Other differences occur due to differences in the processing stages. 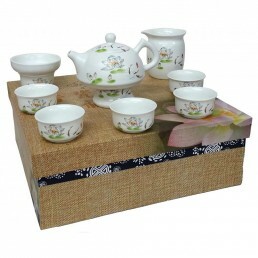 In China tea is always served when guests come to visit. As an important medium of etiquette, tea plays a big role in Chinese relationships. Knowing good tea etiquette, being polite and showing respect when drinking tea in China will reflect your good self-cultivation and will also bring you the pleasantness from drinking tea. In restaurants it is common for diners to clean their bowls and utensils at the table by rinsing them with tea from the pot. The type of tea used influences the kind of infusing vessel, quantity of tea used and brewing times. Water quality is crucial for making the best brew. Spring water from the same location that the tea is grown is best, but this is usually not practical or obtainable. Normally you can use any freshly drawn filtered water. Do not over-boil the water as this can taste flat. A pH of just over 7 is ideal. Different teas need different water temperatures to fully release their flavours. White and Green teas need to be brewed with cooler water (70-80°C). Oolong, Black and Puerh teas should be brewed at higher temperatures. Tea can be brewed in a cup or glass; Gaiwan (a type of lidded cup), an infuser or a Yixing (glass or ceramic teapot). Concerning length and number of infusions, some Green and Black teas can be infused slowly in a cup, and refilled with water when needed. Others, especially good Oolongs and Puerhs, require repeated quick infusions. The proportion of tea to water depends on persoanl taste, but usually not much tea is required for a satisfying brew. 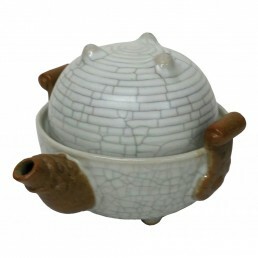 White Tea: The Chinese are most likely to use a small ceramic teapot or Gaiwan. Green Tea: A few strands in a tall glass is normal in China, topping up regularly with cool water. Alternatively use a Gaiwan or a teapot. Jasmine Tea: Jasmine can have an intense flavour so best to go sparingly. Oolong Tea: Some greener Oolongs such as Iron Buddha (Tie Guan Yin) can be brewed very successfully in a cup. Others, especially Dan Congs, need careful handling and brewing in a Gaiwan in a series of rapid infusions to bring out the full flavour. Black Tea: Easy to brew, as they will stand a variety of water temperatures but most like it hot. Using s small teapot, infuser or Gaiwan is the best here. 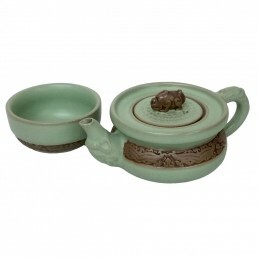 Puerh Tea: A small teapot, preferably a Yixing (Zi Sha) clay pot, is considered essential. The clay of the Yixing takes on the flavour of the tea and adds its own character to the infusions over time. A high proportion of tea to water, boiling water and a series of very short infusions are recommended.